If your dog has recently been sick, is experiencing anxiety, or is a picky eater, they may be underweight. After talking to your veterinarian, you may decide it is best to put them on a weight gain food to help them get back to a healthy weight. We all want our dogs to have the best weight gain dog food, but how can we choose? Our helpful buying guide can sort through the clutter and help you choose a food that’s right for your dog. Tip: Make sure to always consult a veterinarian before using any dog food or supplement. Type - Is it a food or a supplement? Some dogs may have difficulties adjusting to a new food, so a supplement may be a better choice. However, if you’re looking for a total weight gain solution, a food may be right for your dog. Consistency - Some dogs can be incredibly picky when it comes to their food. Dogs recovering from illnesses or with other health issues may be restricted to one type of food. Choosing a dry or wet formula can help your dog get back to a healthy weight. Breed Size- Many dog foods are created specifically for certain breed sizes. If you have an especially small or large dog, you know this can make a huge difference. Weight gain may not mean the same thing based on what size your dog is, so be sure to check this icon. Dog Age- Just like breed size, your dog’s age may play a factor in how they re-gain weight. Some formulas are specifically designed for older and younger dogs, making them the ideal choice for your puppy or senior citizen. Make sure to keep an eye out for this icon. Package Size - How much comes in this package? If your dog is in it for the long haul, buying a larger package may be economically a good choice. But if your dog just needs to gain back a few pounds over a few weeks, a smaller package may be better. Servings- Package size isn’t necessarily indicative of how much of this food or supplement your dog should eat. Keep an eye out for the serving size when buying a weight gain food. You don’t want to be stuck with too little or too much when your dog needs to regain. Your dog can’t wait to start gaining weight, so let’s go ahead and take a look at some of the best dog food for weight gain. Our top and budget picks are listed in the first two slots, so be sure to check both of those out to be sure you get the best food for your dog. Our other eight picks are obviously great choices as well, that’s why they’ve made it to our handy buying guide. Let’s get gaining! 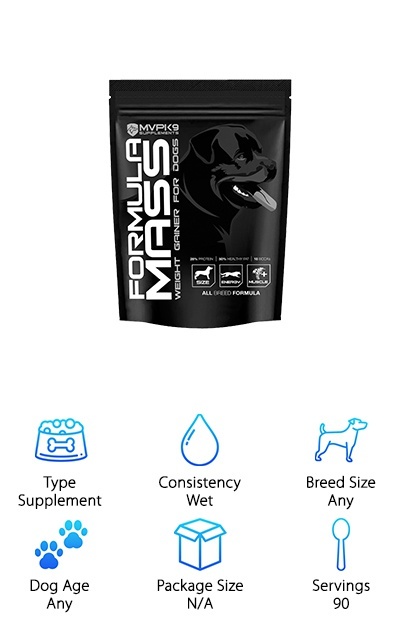 Our top pick is the MVP K9 Mass Weight Gainer supplement. 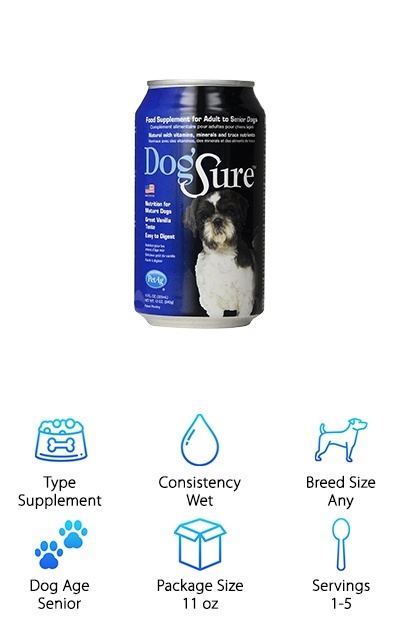 This liquid mixes in with the food you already feed your dog, so it doesn’t interrupt their current routine or cause any added stress for you. This is a great choice for people who are looking for their dogs to bulk up and add body mass. It contains 26% protein and 56% healthy fats per scoop. This food has been evaluated according to GMP guidelines, so you can be sure that is safe to feed your dog. All you do is sprinkle it over your dog's current food, and the weight gainer binds to the existing food and provides the protein your dog needs. This weight gain supplement is especially great for puppies and nursing mothers, who need to put on weight but also need to keep their routine intact while they gain weight. According to MVP, this can also help dogs put on muscle. It is made in the USA. This liquid supplement is a real bang for your buck for dog owners who need a quick, one-time weight gain. It provides around 32 servings per bottle. It provides protein as well as vitamins. It is easy to administer and has a vanilla taste, so your dog will eat it easily. You just add a few teaspoons to their drinking water, or feed it to them through a dropper. This weight gainer can be used for all kinds of animals, not just dogs. 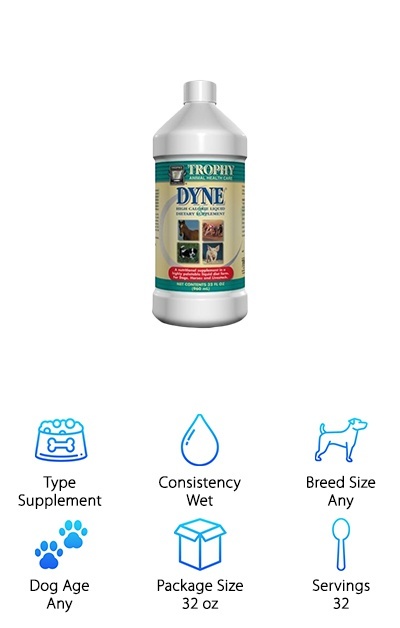 Dyne says it can be used on calves, goats, horses, and sheep as well. For larger dogs, more of the liquid may be needed, so be sure to keep that in mind when looking at the serving size. This would be a great choice for a dog owner with a smaller dog or puppy who needs to put on weight quickly in just a few servings. A great weight gain dog food, this could be the perfect choice for your pet. This gel consistency supplement is a great choice for people looking for a high-calorie nutritional gel. 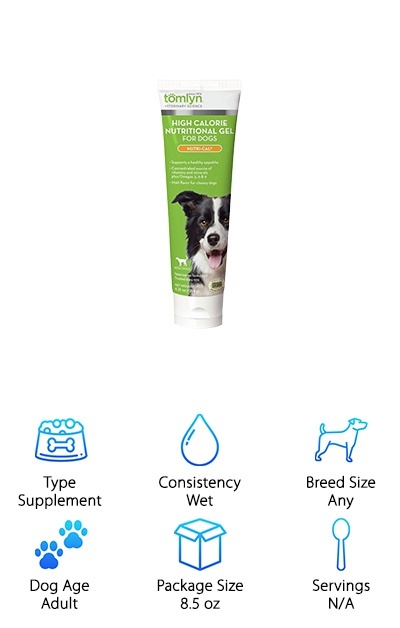 This gel comes in two tubes, which offer a high source of calories for your underweight dog. This gel also provides vitamins, amino acids, and Nutri-Cal claims it can also provide an energy boost. It has a malt flavor to appeal to dogs who are underweight because they are picky eaters. This flavor can also appeal to dogs whose tastes have changed due to a recent illness or lifestyle change. The gel can be incorporated into their existing food without interrupting their mealtime routine or providing too drastic of a change in diet. There are 28 calories in every teaspoon of this gel, which makes it a great choice for dogs really looking to pack in the calories without eating too much supplement. 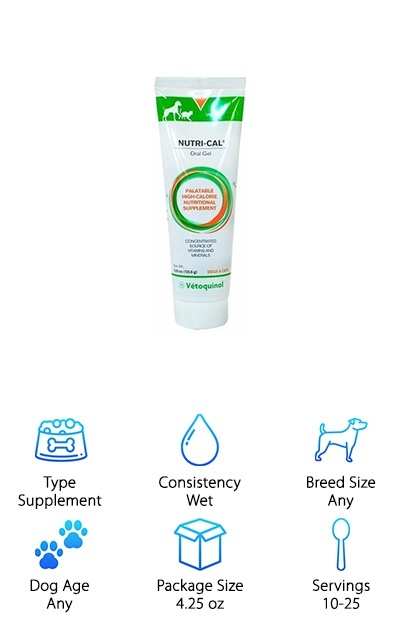 This supplement is recommended by Nutri-Cal for adult dogs, if you have a senior or a puppy, this may not be the right supplement for your dog. STAT is a high calorie dog food designed to allow your dog to gain weight without consuming very much. Just two tablespoons should provide a 20-30 lb dog’s daily caloric intake, according to STAT. For dogs who cannot eat solid food, this can be mixed directly into their drinking water. It can also be administered directly into the dog's mouth with a dropper or syringe if your dog is not eating at all. It can also be used as a supplement with your dog’s existing wet or dry food. 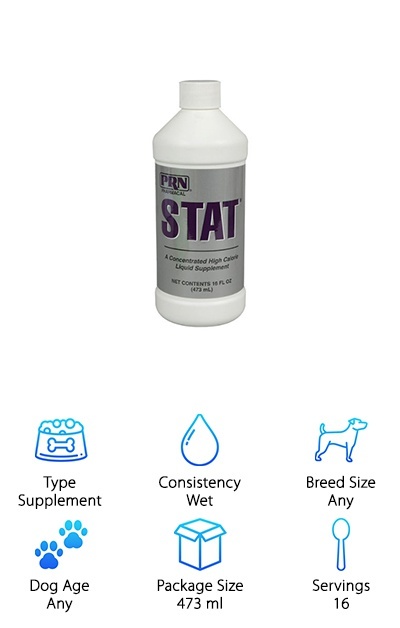 According to STAT, this product isn’t just a one trick pony, it can be used on horses, livestock, puppies, and dogs. This makes it a great tool for any farm owner or person with more than one type of animal. Be warned though, STAT is very specific that this product cannot be used for cats. This is a great product for anyone with sick animals or animals that have recently given birth. This weight gain supplement is a great choice for senior dogs. PetAg says this food is easy for senior dog’s systems to digest, it is high antioxidants, and it has a healthy level of Omega 3 and 6 fatty acids. This formula is also lactose-free, for those dogs who can’t easily digest lactose. This supplement can be used with your dog’s existing food or it can replace traditional meal time. Older dogs can eat and drink less, which can result in unhealthy weight loss. Be sure that your dog is maintaining a healthy weight in their old age. This supplement comes in a vanilla flavor, which your dog may love. Mixing it in with their existing food may motivate them to eat more. Although, if they really only want this supplement, it should have the proper nutrients to replace their mealtime. For senior animals with eating difficulties, this vanilla supplement may be a great choice to help them make the most of their old age. This dog food can replace your current dog’s food. Replacing food can be tricky for picky eaters though, so be aware that your dog should be ready to swap foods entirely when using this high-performance mass gain dog food. 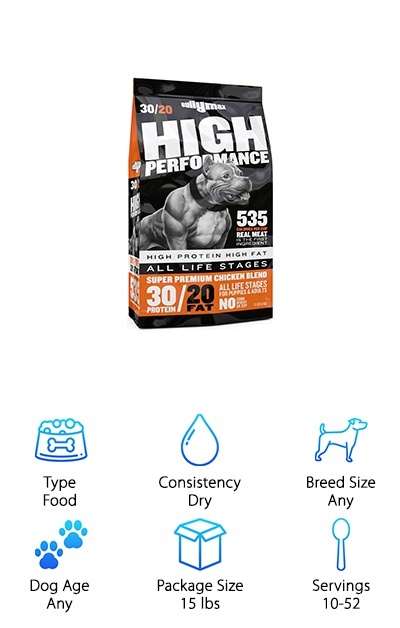 This dog food is good for dogs who are not only trying to build weight but muscle. It is made from a meat based formula and contains no corn, wheat, or soy, according to Bully Max. This food contains 30% Protein and 20% Fat, so your dog is getting the maximum amount of opportunities to gain weight and mass. 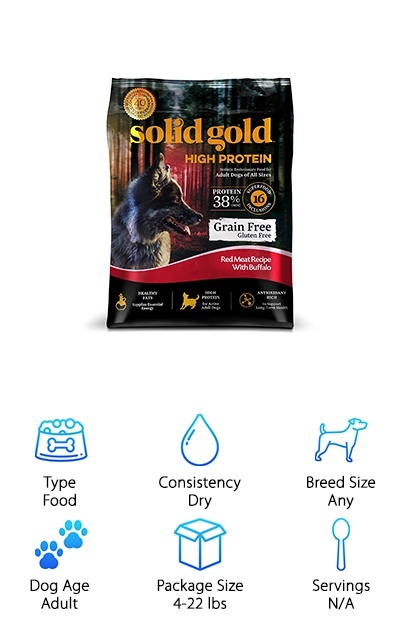 There are 535 calories in every cup of this dog food, so it’s a good choice for someone looking for a high-calorie dry food to replace their dog’s current food with. This is also a great option for people whose dogs are very active and need a lot of calories and protein to fuel their healthy growth. You can buy this food in 15 or 30 lb bags. This supplement is a great addition to your dog’s diet if you’re looking for some extra mass. This supplement can be added on top of your dog’s food to motivate them to eat and pack on the mass and muscle. A supplement can help maximize protein intake. Helping your dog pack on muscle is great for dogs that are very athletic or very active. Many larger dog breeds are very active and have a high need for physical activity. A supplement can help them make the most of their exercise, just like a supplement can help a human. Some weight gain dog food reviews recommend a supplement in addition to a dog’s normal food. Supplements can even help a dog build a shiny coat and healthy skin. 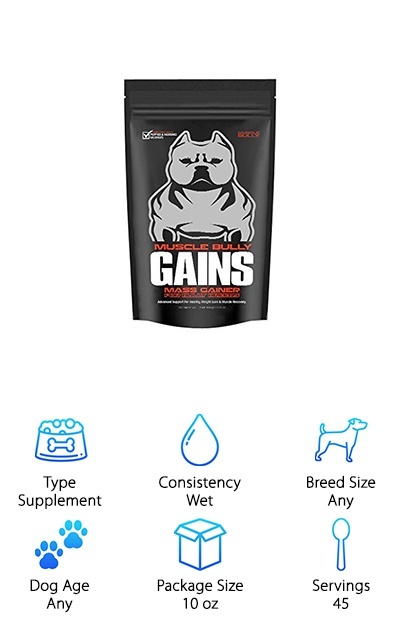 This Muscle Bully supplement is a great choice for dogs who are looking to pack on not just weight but muscle. It is also a great choice for larger breeds, like pit bulls, though it can be used for any breed. This high protein dog food can be a weight gain choice you can feel good about. This formula is all about the 16 superfoods it contains. It is both grain and gluten free. It contains 38% protein, which is a great way for your dog to pack on the pounds it needs. This dog food comes in four different flavors for picky eaters. The flavors are chicken, duck, red meat with buffalo, and salmon and krill meal. The first ingredient listed in all of these foods is the flavor- chicken, duck, beef, or salmon. This can help ease your mind that your dog is always eating something that is made of actual meat. A good way to identify the best dog food to gain weight is to look for how much protein and calories it contains. This dog food is high in both protein and calories. It is also low in carbohydrates and contains no corn, wheat, or soy. This means it’s a great choice even for sensitive dogs. 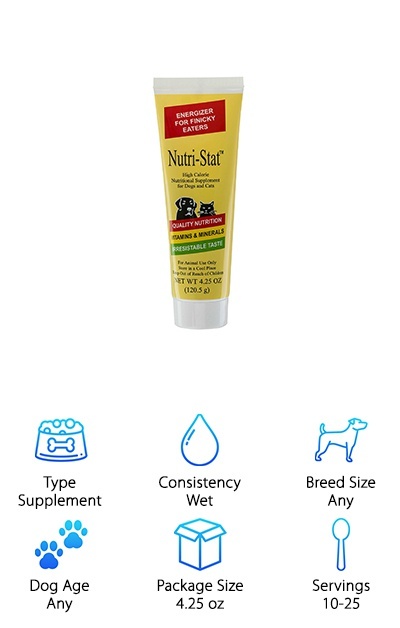 This gel is a great choice for anyone looking for something that can work for both their cat and their dog. This gel is suitable for both your canine and feline friends and has a tasty formula they may like. It is intended to complement their food and provide an extra source of calories and nutritional value for underweight cats and dogs. This is a great choice for pets who are pregnant or sick. It can also be great for athletic or working. It can also help dogs who are used for hunting put on important weight. The paste contains 30 calories of nutrition in every teaspoon. A package should last you for a while with a smaller animal. The suggested serving size is 1 ½ teaspoons per 10 lbs of body weight per day. If your pet is not eating well or is sick Nutri-Cal recommends 3 teaspoons per day. With this does, you should get a lot out of one tube. This supplement can be used on puppies, kittens, adult cats, and adult dogs. It is a high-calorie nutritional supplement, which can be very beneficial for your underweight dog. This supplement also contains electrolytes like potassium, sodium, and calcium. This supplement can be combined with your dog's existing food to increase appetite. It can also be taken on its own if your dog is really not eating well or unable to eat solid foods. For picky eaters, this paste can help energize them to eat more of their existing food. It can provide them with an extra nutrient boost that is important for maintaining a healthy weight and lifestyle. Because it is a gel, it can be a good choice for pets recovering from surgery who cannot eat solid foods. A supplement can help them maintain a healthy weight, even when they are sick. Because it can be used for both dogs and cats of all ages, it’s a great choice for pet owners.